For almost a decade now the development of non-chemical peeling technology has recently been identified as a top priority at the for the California Food Processing and Beverage Industry. Lye peeling is the most industrially used method for processing tomatoes in the U.S. However, due to the pressure of cost and environmental regulations, some tomato processors were forced to use steam peeling to reduce chemical contamination of water. Unfortunately, steam peeling produces undesirable products with deteriorated peeling appearance, high loss in firmness and lowered yields. Existing studies about the success of IR radiation heating for peeling of potatoes prompted interest in using the same technology for tomatoes. Initiatives for pilot plants and testing began. A pilot-scale infrared tomato dry-peeling system was designed, built, and tested. It consisted of a section for feeding of the tomatoes, the infrared heating section, a peel eliminator, and the discharge section. The IR heating unit is equipped a number of IR emitters and an automatically controlled variable speed conveyor system. Surface temperature of tomatoes was measured immediately after IR heating using non-contact IR thermometers that gathered three different measurements on each tomato. The controlled temperatures were in the range of 103 deg. C to 110 deg. C. In this range, a yield of 70%- 85% fully peeled tomatoes could be obtained for all tomatoes sizes, depending on variety and maturity stage. Since IR heating does not use water as a heating medium, the process can be referred to as “IR dry-peeling”. Early results showed infrared (IR) heating for peeling tomatoes as having "remarkable and promising" potential for commercialization by the food industry. Because no water and salt are used in the new peeling process, IR dry-peeling could be the solution for long-term water supply and salinity problems caused by lye peeling. 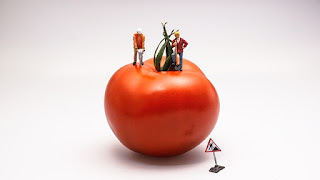 IR dry-peeling also reduced the tomato peeling loss significantly and resulted in similar or better firmness of the product with similar heating time compared to hot lye peeling. The reduced peeling loss and high product quality mean that more valuable and premium products can be produced. Because no salt is used in the peeling, the skins do not contain added salt and can be easily utilized as value-added food products. The average percentage of fully peeled tomatoes obtained from the IR peeling system was much higher than that from steam peeling. The IR peeled tomatoes had a much better texture than the steam peeled ones. A commercial infrared peeling system is predicted to save about 22 percent and 28 percent of the energy when compared to energy used by steam and lye peelings. No water and chemicals are required for the infrared peeling system so there will be no need to treat any wastewater after the peeling process. Public research universities play a significant role in the advancement of many industries, including medicine, composite materials, semiconductor development, analytical equipment and alternative energy sources. Every day, we benefit from discoveries made, or knowledge advanced, from the engineering and scientific research done by our universities. Scientific research almost always involves the careful and accurate control of pressure (vacuum), temperature, level, and flow. Included in most labs are an assortment of testing and monitoring chambers, all with an wide array of peripheral support equipment such as vacuum feedthroughs, thermocouples, heaters, and connectors. Equipment size, shape, and material selection vary widely, and many times compromises in component specifications vs. design requirements are made, with component purchases being driven by off-the-shelf-parts. These decisions are driven by the assumption of favorable cost and delivery time over those of a custom solution. Any downside to design compromise is chalked up to schedule and budget. There's good news on the custom feedthrough front though. One manufacturer, Northern California's BCE, has adopted processes and techniques that deliver prototypes and low production-run custom feedthroughs quickly and inexpensively. Domestic natural gas production from shale resources is proving to be more economical and environmentally sustainable for the United States. Unfortunately, part of this gas resource is lost through methane leaks, which is also a greenhouse gas detrimental to the environment. Thus, in order to increase the efficiency of this process, it is vital to monitor methane emissions to keep them at an absolute minimum. It is for this precise development that BCE was approached by a large American University requesting a feedthrough that would be used as part of an elaborate methane sensing device. The feedthrough needed to meet specific requirements in order to become an integral part of the existing assembly. BCE proposed its 18 wire vacuum feedthrough configuration for this specific application. All conductors were sealed into a brass bushing adapter with ½” BSPP mating male threads. Moreover, BCE’s proprietary black epoxy was used; meeting NASA ASTM E595 low outgassing standards to prevent contamination. The requested wire configuration was also respected and the feedthrough was tested to ensure its vacuum compatibility meeting customer demands. Furthermore, all requirements were met to ensure a seamless integration to the existing methane sensing device. Thermal sensing inside a vacuum chamber is essential in many processes. It is therefore necessary to have a feedthrough that not only ensures vacuum compatibility, but which also allows easy replacement and maintenance of thermocouples and components. This is precisely what BCE’s Replaceable 10X Thermocouple Feedthrough renders. With 10 thermocouples installed inside stainless steel compression fittings, multiple temperature readings can be taken from inside the vacuum chamber simultaneously. As the thermocouples are compressed, they can be easily extracted for maintenance or replacement purposes. The compression fittings in turn are threaded into a standard CF flange with an O-ring groove that mates directly to the chamber port. Thus, they can also be removed and replaced with ease. The entire construction is stainless steel for added durability and cost effective machining of parts. Thermocouple leads are available in multiple materials including Kapton for higher temperature applications. Hence, there is virtually no contamination.